More repaints -- starting with Maddy, a recolor of Serpentina. Yes, we've seen more than enough repaints by now, but I'm not too upset with this one. Where Serpentina had a schoolgirl look, the purple and almost indistinguishable dark reds of Maddy's outfit gives it a distinctly suit-like look -- which effectively makes Maddy look like a teacher and works quite well with the red eyes and the sneer. Her comic, however, still casts her in an adorable light. Either works for me, really -- Maddy's hot stuff regardless of her disposition. 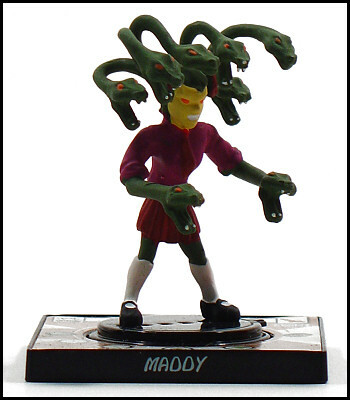 Clearly I don't think Maddy's all that creepy or freaky -- far less so than Serpentina, though I'm hard pressed to explain precisely why that is -- but her yellow face and snake theme suggests to me that she is possibly the love child of Evil-Lyn and King Hiss. And considering that King Hiss was basically a pair of humanoid legs with a mass of writhing snakes for limbs and a torso, the image of them hooking up is definitely in keeping with the name of the line. And in another pairing of these two molds, Maddy is accompanied by Litter Kitty, a third-generation repaint of Sox and Spitty Cat. 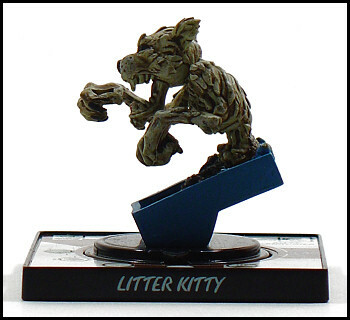 He does improve upon Sox's most glaring flaw by having a white color scheme that effectively highlights the detail on the figurine, but the rotting cat thing has still been done to death. I'm also still miffed that they didn't think to repaint the litter box here either. Are all litter boxes blue or something? Google says no, though admittedly quite a few of them are. A black or a grey box here would've been ideal. Litter Kitty might have been creepy or freaky if he weren't the third zombie cat I've seen in about as many weeks, to say nothing of the undead animals that have appeared in multiple films (Pet Sematary comes to mind). The idea is wholly underwhelming at this point.